Kevin Harvick won the pole for Saturday night’s Sprint Cup Series race at Charlotte Motor Speedway by edging substitute driver Alex Bowman in Thursday’s qualifying session. Havick laid down a lap at the 1.5-mile CMS track in 27.547 seconds (196.029 mph) and in doing so, knocked Bowman from the top of the pylon. 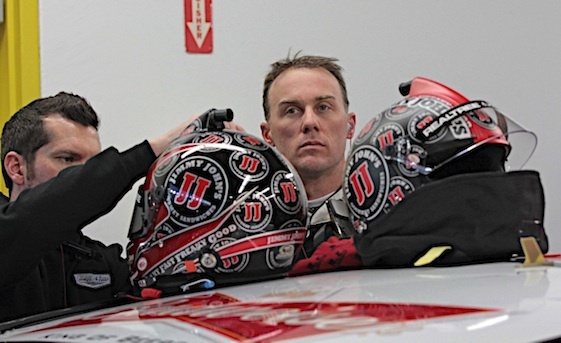 The pole was Harvick’s first at Charlotte. Where Harvick gave up speed in the final two corners, Bowman likely lost the pole in the first two turns, where he drifted up the track slightly and scrubbed off just enough speed to fall short of Harvick by the minute fraction of a second. “The Showman Bowman was fast tonight,” Dale Earnhardt Jr., for whom Bowman is subbing, tweeted after the final round. Bowman, the fastest of the non-Chase drivers in time trials, recently posted his career-best NASCAR Sprint Cup Series finish, a 10th at Chicagoland Speedway. Though Bowman continues to show excellent speed as a substitute, he has no definite plans for next year. “Honestly, we didn’t put the greatest lap together,” Bowman said. “In (Turns) 1 and 2, we were a little free in (into the corner) and didn’t really keep it on the bottom like I needed to. (4) Kevin Harvick, Chevrolet, 196.029 mph. (88) Alex Bowman(i), Chevrolet, 196.000 mph. (24) Chase Elliott #, Chevrolet, 195.759 mph. (18) Kyle Busch, Toyota, 195.228 mph. (14) Tony Stewart, Chevrolet, 195.228 mph. (47) AJ Allmendinger, Chevrolet, 195.087 mph. (78) Martin Truex Jr, Toyota, 194.826 mph. (19) Carl Edwards, Toyota, 194.553 mph. (11) Denny Hamlin, Toyota, 194.168 mph. (22) Joey Logano, Ford, 194.049 mph. (48) Jimmie Johnson, Chevrolet, 192.630 mph. (5) Kasey Kahne, Chevrolet, 188.547 mph. (10) Danica Patrick, Chevrolet, 194.161 mph. (16) Greg Biffle, Ford, 194.007 mph. (17) Ricky Stenhouse Jr, Ford, 193.966 mph. (1) Jamie McMurray, Chevrolet, 193.868 mph. (20) Matt Kenseth, Toyota, 193.791 mph. (21) Ryan Blaney #, Ford, 193.736 mph. (3) Austin Dillon, Chevrolet, 193.722 mph. (2) Brad Keselowski, Ford, 193.625 mph. (31) Ryan Newman, Chevrolet, 193.209 mph. (95) Michael McDowell, Chevrolet, 193.009 mph. (41) Kurt Busch, Chevrolet, 192.205 mph. (83) Matt DiBenedetto, Toyota, 191.489 mph. (42) Kyle Larson, Chevrolet, 191.980 mph. (34) Chris Buescher #, Ford, 191.829 mph. (6) Trevor Bayne, Ford, 191.544 mph. (27) Paul Menard, Chevrolet, 191.530 mph. (13) Casey Mears, Chevrolet, 191.469 mph. (44) Brian Scott #, Ford, 191.381 mph. (15) Clint Bowyer, Chevrolet, 190.954 mph. (38) Landon Cassill, Ford, 190.617 mph. (43) Aric Almirola, Ford, 190.564 mph. (23) David Ragan, Toyota, 190.054 mph. (7) Regan Smith, Chevrolet, 188.864 mph. (98) Cole Whitt, Chevrolet, 186.002 mph. (46) Michael Annett, Chevrolet, 185.976 mph. (32) Jeffrey Earnhardt #, Ford, 185.039 mph. (55) Reed Sorenson, Chevrolet, 183.673 mph. (30) Josh Wise, Chevrolet, 183.343 mph.